The Hayloft Self-cateringA popular first floor cottage apartment, dating from about 1704 and converted from the old hayloft overlooking the cobbled Croft Courtyard. 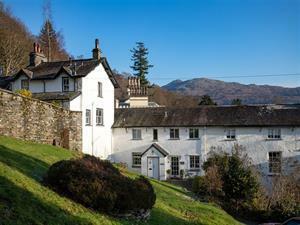 This property is an ideal location settled between Ambleside and Hawkshead, providing views over towards Wansfell and only a 5 minute drive to the beautiful villages of Elterwater and Chapelstile in the Langdales. A popular first floor cottage apartment, dating from about 1704 and converted from the old hayloft overlooking the cobbled Croft Courtyard. Fuel charged extra £8 per week Apr - Sep, other times £12 per week. Children welcome from any age. The Hayloft offers weekly bookings starting on Saturday.